The long, cold winter at Aqueduct will formally begin after the “official” sign goes up for Saturday’s running of the Cigar Mile — the last graded stakes race to be run in New York this calendar year. Before you reach for the earmuffs and mittens, however, Saturday’s Cigar Mile card looks like a doozy and should offer plenty of good racing and wagering opportunities throughout the day. Besides the $750,000 Cigar Mile (G1), the Dec. 1 card at Aqueduct also includes three other graded stakes races, the $250,000 Remsen (G2) for 2-year-olds, the $250,000 Demoiselle (G2) for 2-year-old fillies, and the $250,000 Go For Wand Handicap (G3) for fillies and mares. If you can pick the winner of these four feature races, you will be on your way to a successful Saturday at The Big A.
Saturday’s feature race, of course, will be the running of the Cigar Mile and while the race has not drawn a star-studded field this year, it certainly did come up as a wide-open handicapping puzzle and a good betting race. The morning line favorite is Mendelssohn at 2-1 — and regular rider Ryan Moore is at Aqueduct to ride. The 2018 season mainly has been disappointing for Mendelssohn, who was bet to 6-1 in the Kentucky Derby but suffered a tough trip and finished last. That race was followed by losses in the Grade III Dwyer (as the favorite), the Travers (G1), the Jockey Club Gold Cup (G1) and the Breeders’ Cup Classic (G1). Yes, Mendelssohn has been facing top-rung competition along the way and a win in the Cigar Mile could do a lot to mend some wounds, but he seems like a bet-against as the favorite in the Cigar Mile to round out a disappointing year with yet another disappointing loss. 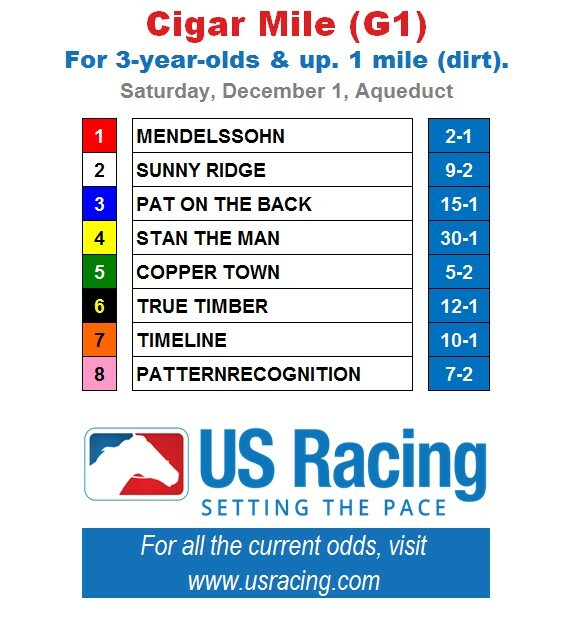 Contention runs deep in the Cigar Mile, with the Kelso (G2) first-, second- and third-place finishers Patternrocognition, Sunny Ridge and Timeline in the race, in addition to Empire Classic winner Pat on the Back and Todd Pletcher’s promising Copper Town standing in the way as the main challengers. To me, the Chad Brown-trained Patternrecognition is coming up to the race best, as the up-and-comer and will be the horse to beat at 7-2 odds on the morning line. He is already 2-for-2 in his career at The Big A, picks up Jose Ortiz and owns standout speed figures at this one-turn mile trip. Earlier on the card, the day’s strongest favorite will take the track in the Go For Wand Handicap when Marley’s Freedom goes postward as the likely even-money favorite. Mike Smith comes in to ride, which certainly will help the chances but hurt the odds even more for a filly that figures to be low odds. She’ll be tough to beat, no doubt, but if you are looking for chinks in the armor with an eye on beating the favorite, I believe Marley’s Freedom is vulnerable. Marley’s Freedom was upset by Shamrock Rose in the Breeders’ Cup Filly & Mare Sprint (photo by Steve Heuertz). First off, the one-mile distance of the Go For Wand will be the furthest Marley’s Freedom has ever been in her career, and sometimes late-closing sprinters just aren’t as effective when stretched out — even when the added distance seems like it would be just what the doctor ordered. Secondly, horses making post-Breeders’ Cup starts late in the season are always a hit-or-miss proposition, especially ones like Marley’s Freedom who were Breeders’ Cup disappointments. Marley’s Freedom was odds-on in the Filly & Mare Sprint (G1), but settled for a sub-par fourth-place check. Before losing in the Breeders’ Cup, however, she did reel off four straight wins, including the Grade 1 Ballerina at Saratoga, so her best definitely is good enough. But will she show up with her best effort in the Go For Wand for trainer Bob Baffert? Maybe. If not, the most likely Go For Wand upsetters will be Your Love at 4-1 odds on the morning line, and Come Dancing at 10-1. Your Love was a minor stakes winner at Saratoga for Chad Brown and then graduated into graded stakes with a runner-up finish last time in the Gallant Bloom (G2). This seems like the perfect spot for her to try again. Come Dancing exits a fifth-place finish in the Beldame — a 1 1/8-mile test that was too long for her — but she’s dangerous with the cutback to one mile here and can handle any kind of track condition. John Velazquez, who won the Royal Delta Stakes (G2) aboard her two races ago, is back aboard for trainer Carlos Martin. The Remsen and Demoiselle are always extremely interesting late-season juvenile races that catapult contenders onward to the following year’s Kentucky Derby and Kentucky Oaks. Who are the horses to beat in these Grade 2 stakes this year? The Demoiselle drew only a seven-horse field and will go as race four on Saturday, but, nevertheless, it looks like a good race. The morning line favorite appears to be legit in the form of Enliven at 6-5, trained by Kiaran McLaughlin. Enliven exits a second-place finish in Aqueduct’s Tempted Stakes (G3), where she earned a big speed figure over the track even in defeat. The race is far from a walkover, however, because all seven fillies in the race appear to have a chance. Top challengers are led by Molto Bella at 3-1 trained by Ian Wilkes, who exits a second-place finish in the ungraded Rags to Riches stakes at Churchill last time. There are also two interesting up-and-coming prospects in the Demoiselle field, in my opinion: Girl of Tosconova at 15-1 odds for trainer Charlton Baker and Filly Joel at 7-2 odds for trainer Rudy Rodriguez. Girl of Tosconova debuted in a maiden claiming race, but looked tremendous crushing that field by nine lengths. She then came back to run a very solid second behind repeat next-out winner South of France in a starter allowance last time. She shouldn’t be overlooked, nor should Filly Joel, who had some troubled trips in sprints trying to break her maiden, but then did so with style last time when stretched out to a route for the first time. Finally, there is the Remsen, which always seems to produce a top Kentucky Derby contender or two every year. Who will it be this year? This year’s Remsen drew only a seven-horse field, but it is headlined by two very strong-looking contenders — at 6-5 and 7-5 morning-line odds, respectively. These two standouts are Maximus Mischief, invading from Parx for trainer Robert Reid, and Network Effect, trained by Chad Brown. Multi-race players will certainly want to include both horses on their tickets and they do seem like a pretty straightforward exacta box in this race. If there is a preference between the two, mine would go to Network Effect, based purely on the connections and the pace. Network Effect is a pace-presser/stalker who seems likely to get a very good trip in this race, while Maximus Mischief might have to battle it out on the lead the whole way — with some stretch-out sprinters in this field likely to ensure a hot pace. Nevertheless, Maximus Mischief has reeled off two very impressive wins to begin his career, including an eight-length maiden score with a big speed figure followed by a six-length allowance win with an even bigger speed figure. Saturday will be the day when he proves whether or not he’s the real deal. Enjoy this great, last hurrah at Aqueduct before winter racing returns to New York for the remainder of the year. Cigar Mile Day is always one of the best racing and wagering dates of the year at Aqueduct — and this year is certainly no exception. Good luck on Saturday. Enjoy!